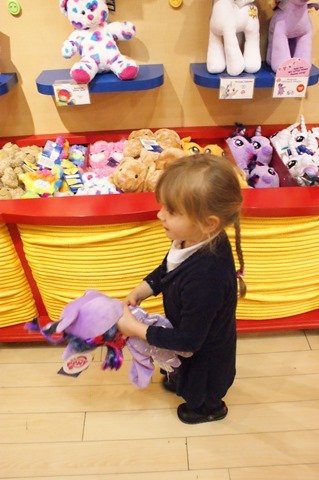 We have visited the Build a Bear Workshop on a few occasions now and it has always left quite the impression on Little Legs, it’s no surprise really, what 4 year old wouldn’t like to build and create their own stuffed toys? It has become of firm favourite whenever we go shopping and is a place she insists that she visits every time. We have quite the collection of Build a Bear friends and they are equally loved and adored by our little lady. 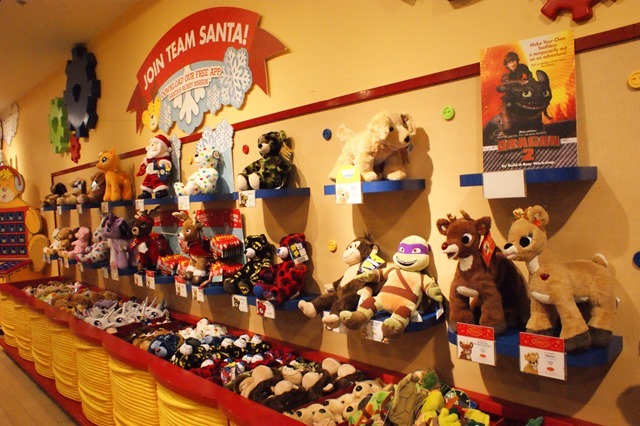 If you are not familiar with the Build a Bear Workshop it’s pretty much a children’s haven, a place for them to select, stuff, build and dress soft toys. Those are the toys that they can add a personal touch to and make them truly their own. We were recently asked along to our local store to review the whole process and there was not a chance that I could say no to that. 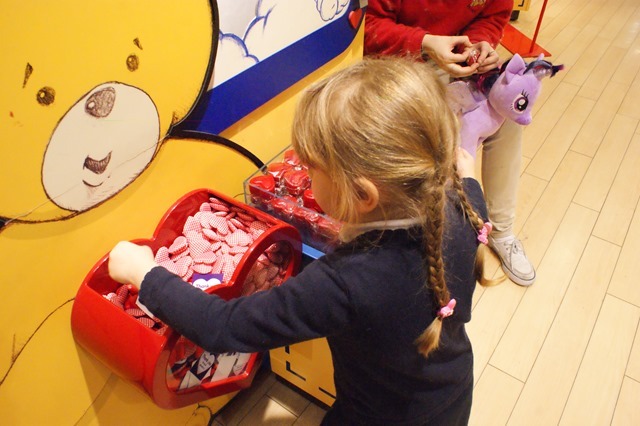 Little Legs had been doing particularly well with her rewards chart so after school one day we took an adventure to our local Build a Bear Workshop. When we arrived at the store we were greeted by a lovely team member called Rhian, who looked after us brilliantly. Little Legs was super excited to get started and took her time selecting her new pal from the large variety available. 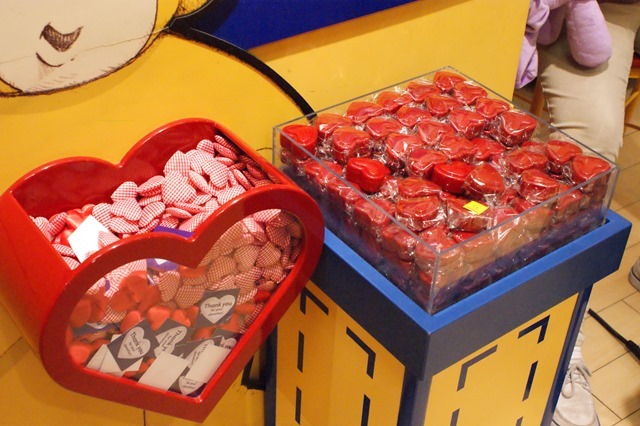 The choice is huge, including build-a-bear buddies of all colours, they have quite the range of well known characters and themed characters too like, Frozen, Disney Palace Pets, Super Heroes, Hello Kitty, Teenage Mutant Ninja Turtles and of course My Little Pony. Anybody that is familiar with Little Legs will know that she is a huge My Little Pony fan so there was no contest really, she knew that she had to have a pony. 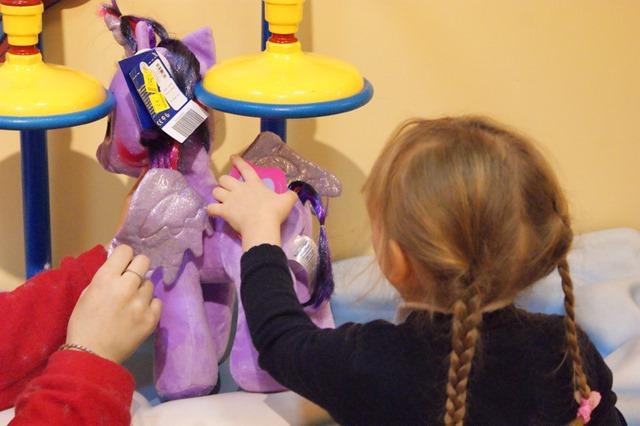 At the time in store they had Princess Celestia and Princess Twilight Sparkle available, to start her collection she picked out Princess Twilight Sparkle, a gloriously soft plush purple pony with amazing hair, a fabulous unicorn horn and the recognisable cutie mark. Once you have picked your toy then the fun really begins, starting with selecting if you would like your new cuddly pal to have any sounds. There’s quite the selection available from “I Love You” to character catchphrases and theme songs. These sounds are popped inside the cuddly toy and pay when pressed. Naturally Little Legs had to have the “Friendship is Magic” theme tune which Rhian very kindly positioned behind the ponies cutie mark. Next came the little heart which you kiss and then make a wish on (i’m pretty sure Little Legs whispered something about having a real life pony) and that is also popped inside the bear. Now with the help of the store staff your little one can bring their chosen toy to life by filling it with stuffing, this is done by your child stepping on a pedal which pumps fluffy stuffing into your bear. Children can choose how squishy they want their toys to be which I thought was rather lovely, Little Legs checked the huggability of her bear and decided it needed “just a little bit more”. Before the toys are ‘sewn’ up there is one last thing that could go inside, a scented heart for those that would like their selected stuffed toy to have a lovely smell, there were a few scents available from bubble gum, strawberry and even banana (at least I think it was banana) Isabelle went for the strawberry option and to my surprise, even through all the stuffing inside the toy, you can actually smell it. So now we had a fully stuffed Princess Twilight Sparkle that was the correct squishiness, played the My Little Pony Friendship is Magic theme and smelt amazing. The fun didn’t stop there though, it was time to give the toy a little spruce, after being in a tub full of all the other ‘skins’, you want to make sure there are no loose bits of fluff or thread and you might want give them a brush to fluffy them up a little. Next was the bit that Little Legs was so excited about, the clothes and accessories. Bazillions of them, seriously, there’s a lot to choose from. Some of the bears have specially designed outfits but your little one can choose whatever they like (we’ve had BatBunny before and Spider Monkey). So off over to the dressing room we went. 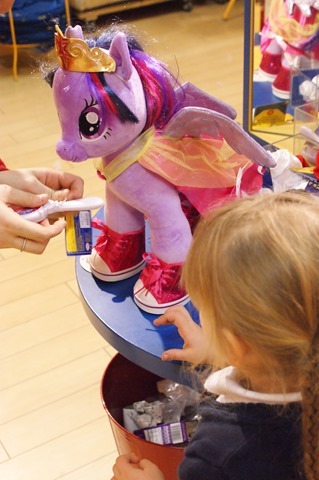 Little Legs is nothing but thorough, Princess Twilight Sparkle required the specific Princess Twilight Sparkle costume which consisted of a pretty cape and a tiara. Obviously Princess Twilight Sparkle needed to protect her modesty so Little Legs picked out a pair of pink knickers to resolve that issue quickly. If that wasn’t enough, no pony would be seen dead without shoes and as Little Legs very politely pointed out, Princess Twilight Sparkle is a pony with 4 legs and therefore required 2 pairs of shoes, the pretty pink sparkly shoes to be in fact. 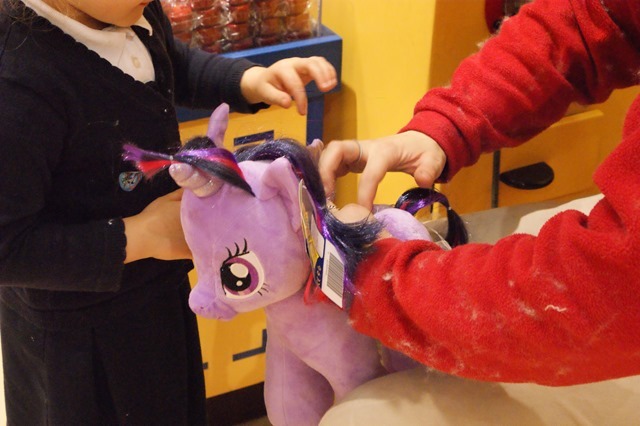 Princess Twilight sparkle was almost ready to go, she just needed the finishing touches to her beautiful hair, some rather fetching hair clips, colourful extensions and a My Little Pony hair brush for keeping that beautiful hair tidy. The clothing and accessories start at around £2 and there really is such a huge range to choose from to personalise your new bear. The costumes and accessories will fit the majority of the bears so you can swap and change as you please. For the final part it was time to register Princess Twilight Sparkle, give her a name and print our her birth certificate. 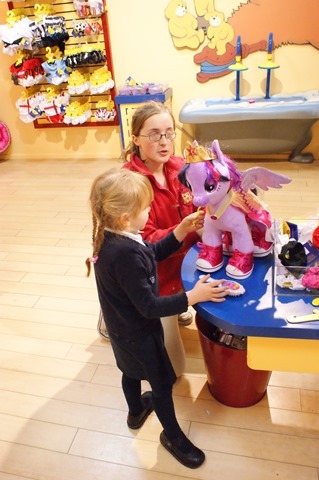 Of course Little Legs named her pony Princess Twilight Sparkle because “that’s just silly” to call her anything else. Once the bear was registered I also gave my details which meant that if Princess Twilight Sparkle was ever lost and found by somebody else, they could take her along to any Build-A-Bear Workshop and they will locate the owners to let them know the bear has been found….how amazing is that? I know Little Legs would be distraught if she lost one of her bears so I think that this is a great idea, especially as there is hope that the bear might be returned if found. Finally before it was time for us to leave, Little Legs had to recite the Build-A-Bear promise, her promise to look after and take care of her newest pal. It was probably one of the cutest things I have ever seen, with her hand on her heart she recited The Bear Promise in front of the whole store. 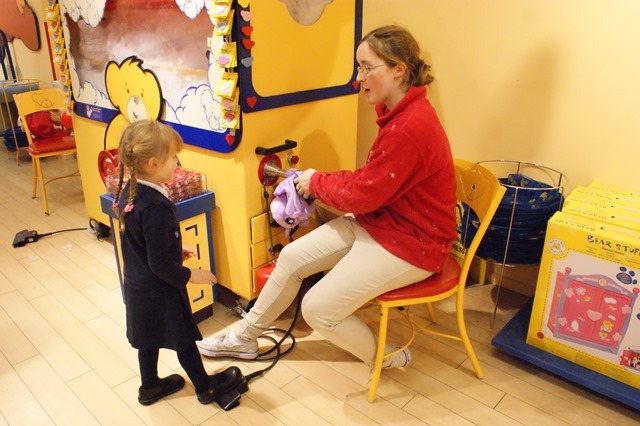 Our experience of the Build-A-Bear Workshop has been amazing, the staff are wonderfully patient with Little Legs and make the whole process exciting. I can certainly see why children find it so fun rather than picking out a toy in a shop. It was very much like we had all the time in the world and didn’t feel rushed at all. The staff wanted to make sure that Little Legs was completely happy with her finished product. 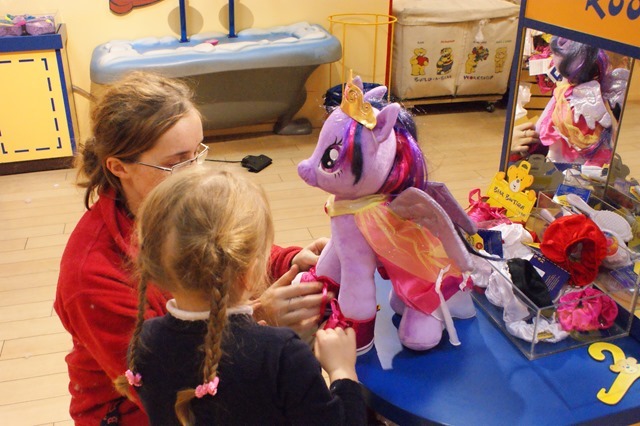 Prices of the bears vary but are very reasonable starting at around £9, our Princess Twilight Sparkle was £19 (+ the cost of clothes and accessories but they aren’t compulsory) and the quality is excellent, we have many little pals. You can purchase the bears from the online shop but I would personally recommend going into the store to get the full experience of creating your new pal. 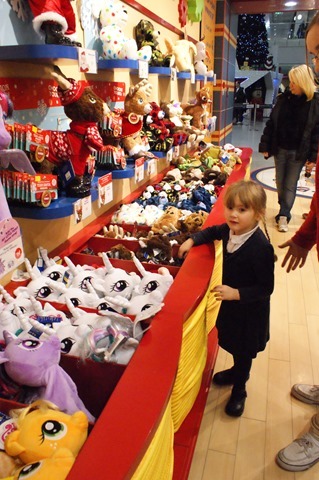 You may have also read one of our previous Build-A-Bear posts where we received Pudsey Bear to review. 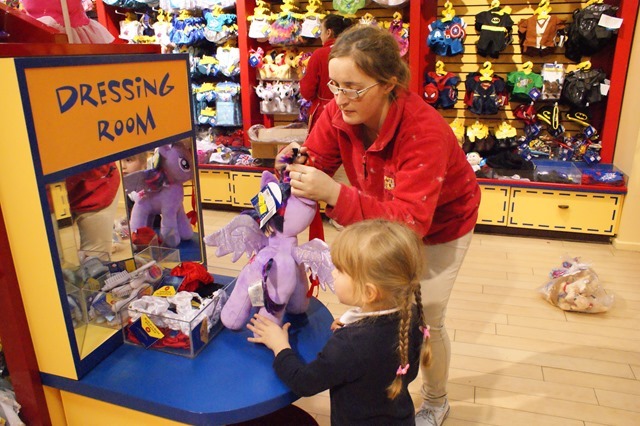 Well Build-A-Bear are still working with Children in Need where for every purchase of the rather adorable Spots of Fun Pup , £1 of the sale goes towards BBC Children in Need which funds projects supporting disadvantaged children and young people in the UK. Little Legs is now very much looking forward to saving her pennies for Rainbow Dash and Fluttershy. Thank you to the staff for making our visit such a pleasurable experience and also Thank you to Build-A-Bear for inviting us. We were asked to review the Build-A-Bear experience and as such Little Legs was provided with her chosen bear, however all thoughts and view are our own.